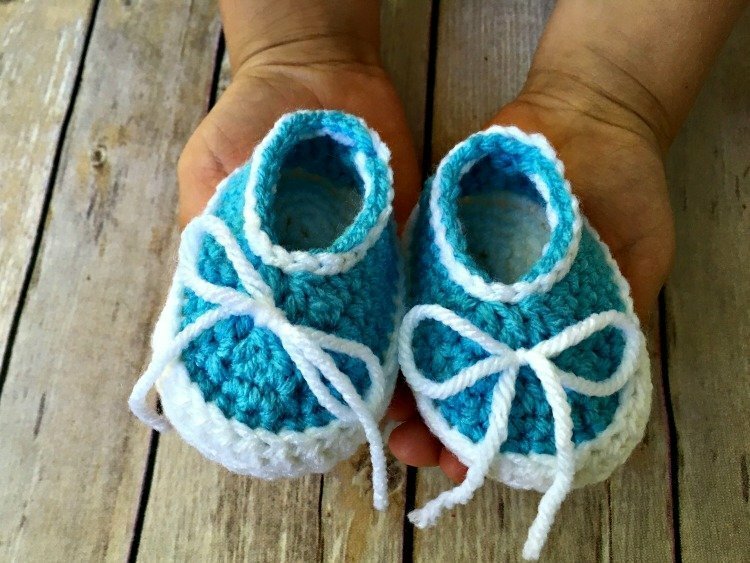 Simple Baby Slip-On Booties - Free Crochet Pattern - love. life. yarn. 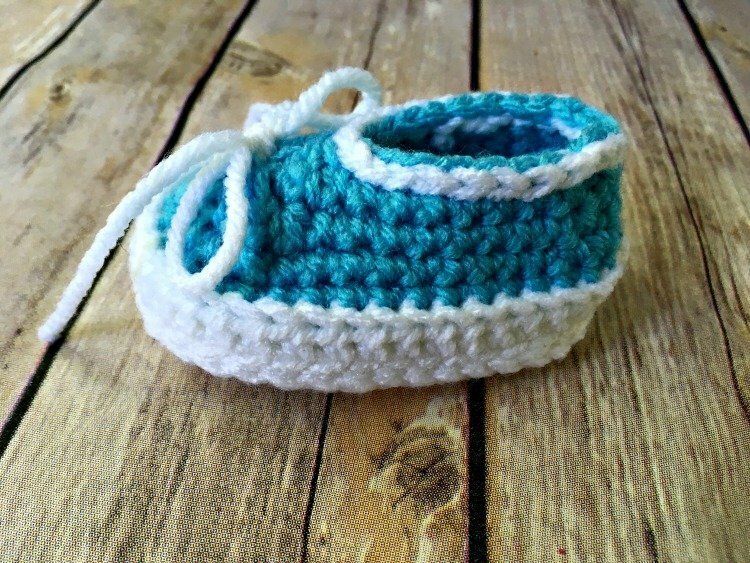 It’s been a while since I’ve designed a pair of baby booties and with a new arrival coming in the next few months I thought it was time I worked up another design. 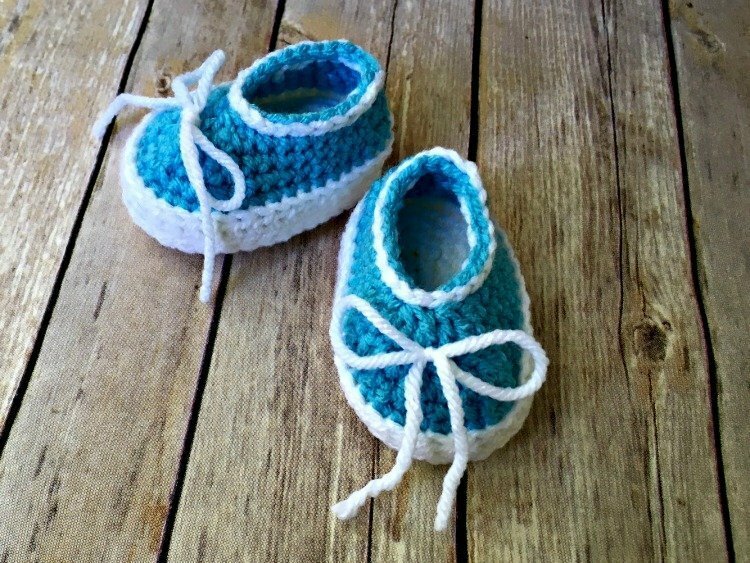 I wanted something simple that could be made in many colors for either a boy or a girl (although I picked blue since we are having another boy!) and I wanted to try out a technique I had been thinking of for a thick sole that looked more like tennis shoes. 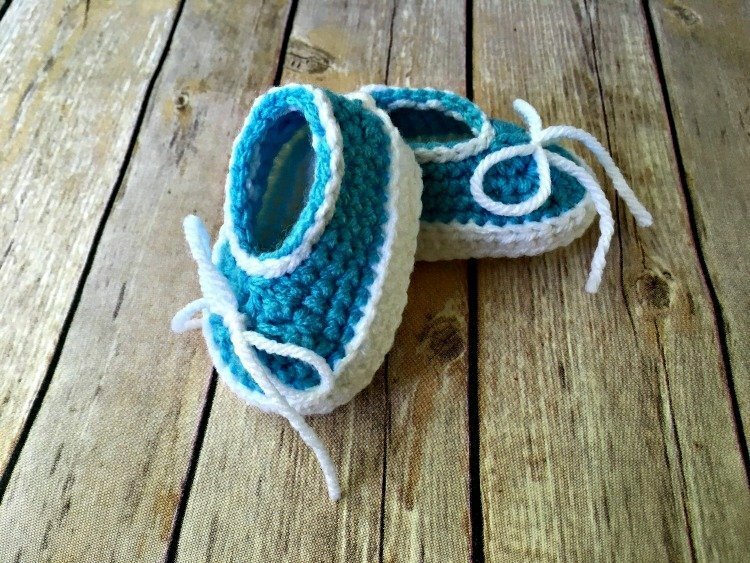 I like the way the finished booties turned out and I think I’ll try this sole again in the future. One yarn I keep going back to again and again when making baby booties is Red Heart Baby Hugs. I wanted these to be a bit wider than some of my other booties so I chose to use the Baby Hugs in Medium. My little guys tend to have chunky feet (they are big babies too – my smallest was 9 lbs!) so I wanted a bit wider shoe that could hold a little wider baby foot. Holding 2 soles together with RS facing out, join MC in center heel stitch, going through both soles. Sl st around edge to join soles. Do not fasten off. Notes: I started with a ch-2 working around the sole with the RS on the inside of the shoe. This does leave a strand of yarn carried up the back but you can help weave this in when you weave in the MC ends as seen in the photo below. If you prefer not to do this, after you slip st the soles together you can make an invisible join in the slip sts and join the yarn at the center heel, making sure the RS of the shoe is on the inside for round 1. For rounds 2 and after the RS will be on the outside of the shoe. Be sure to turn after round 1 only. Do not work into same st as join for these rounds. Round 1: Ch 2 (counts as hdc), hdc in both loops of each slip st; join with slip st to ch-2, turn – 39 (43) sts. Change to CC. Round 2: Ch 1, sc in back loop only of each hdc, join to first sc with slip st. Round 3: Ch 1, sc 10 (12), (sc 2, sc2tog) four times, sc 13 (15); join to first sc with slip st – 35 (39) sts. Round 4: Ch 1, sc2tog, sc 8 (10), hdc2tog, (dc3tog) twice, hdc2tog, sc 8 (10), sc2tog, sc 5; join to first sc with slip st – 27 (31) sts. Round 5: Ch 1, sc 7 (9), (dc3tog) twice, sc 8 (10), sc2tog, sc 2, sc2tog; join to first sc with slip st – 21 (25) sts. Change to MC. Round 6: Slip st in each st around. Make invisible join. Weave in all ends. Tie a MC bow in front if desired. 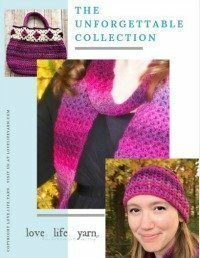 I hope you’ve enjoyed this free pattern. 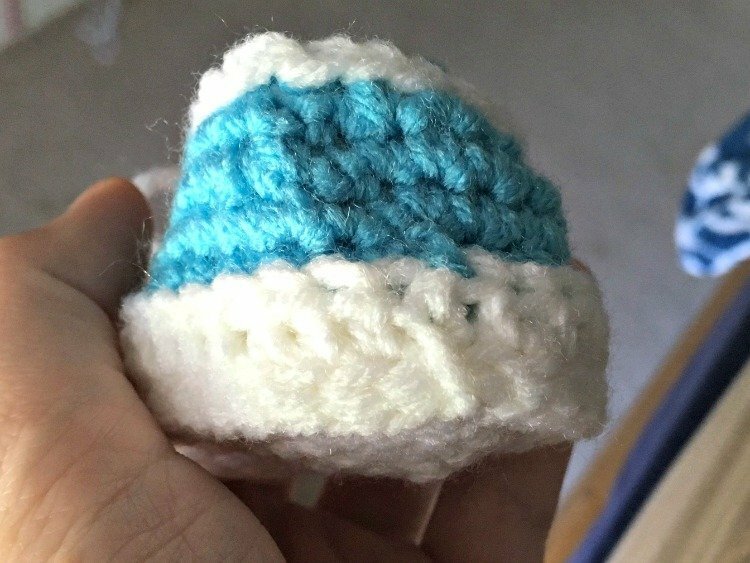 Be sure to check out my other free baby patterns, too!